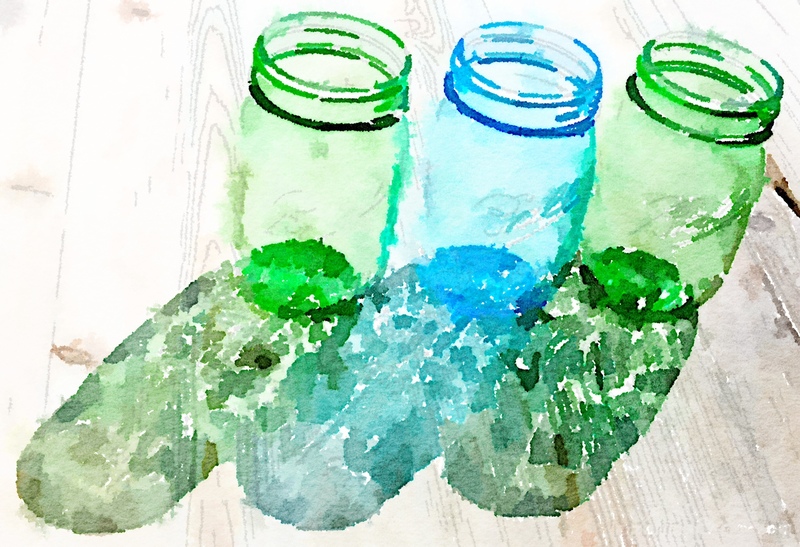 Imparting Grace: The beautiful new GREEN Heritage canning jars and a GIVEAWAY! 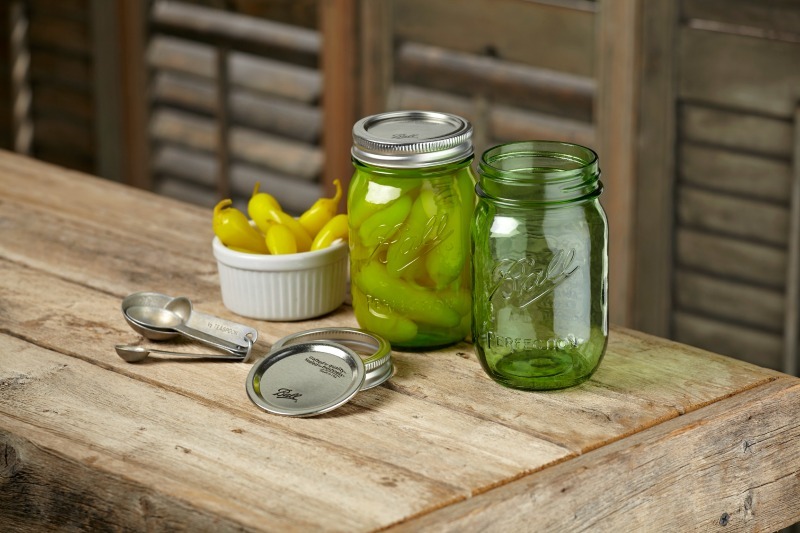 The beautiful new GREEN Heritage canning jars and a GIVEAWAY! You may remember that last year I was taken with the blue Ball Heritage Collection jars. 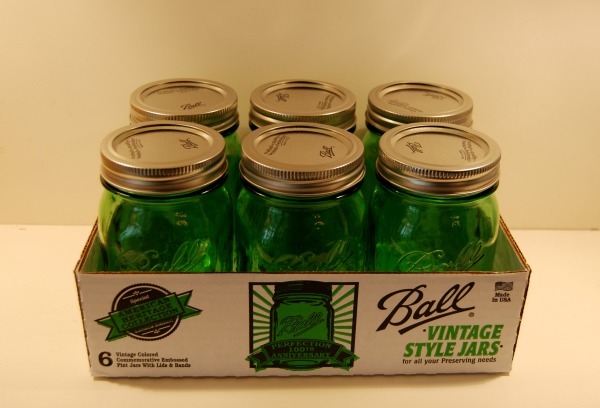 Well, this spring I was delighted to learn that Jarden Home Brands, makers of Ball brand home canning products, is introducing a new limited edition of Ball Heritage Collection jars in a new color--spring green! Available in both regular-mouth pint size and wide-mouth quart size, these are "Perfection" jars, celebrating the 100th anniversary of the the Ball brothers' "Perfect Mason" jar. Aren't they gorgeous? These jars pay tribute to the original jars created in 1914 in Muncie, Indiana. Of course, these jars meet all modern standards for quality and reliability, and after 100 years they are still 100% made in America. 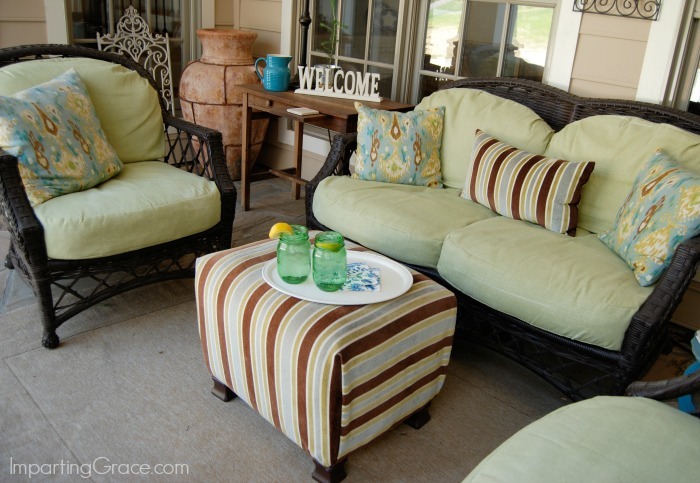 Here are a few ways I'll be using these lovelies in my home this spring. Of course they make wonderful drinking glasses, and doesn't the green color look great on my front porch? For my next party, I think I'll use them to hold cutlery. 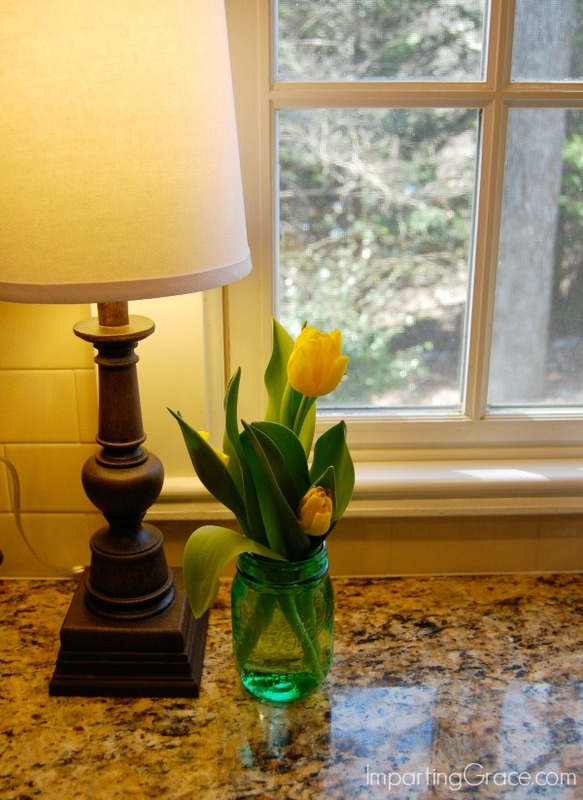 And as a simple flower vase, these can't be beat! I'm in the process of making some changes to my kitchen, including painting my island--you guessed it!--green, so these green jars arrived just in time for me! I know you're going to love these as much as I do, and I'm thrilled to be able to give away a case of these jars to one of you! Just follow the simple instructions and enter via Rafflecopter. If you're reading in an email, click over to my blog to enter. Good luck! **Disclosure: Jarden Home Brands provided me with a case of these jars to preview and will provide a case to the giveaway winner. I received no compensation for writing this review, and all opinions are strictly my own. I love the green. I bought the blue last year and I can't wait to mix them up! I would love to use these for flowers this Spring. I would probably fill them since I do tons of canning. But I may use them as vases until I got them filled. What beautiful jars! I am a huge fan of mason jars and use them all the time. Thanks for letting me know about the green jars. Beautifully staged! Loved the blue and these are gorgeous, thanks for sharing! Beautiful photos. If we weren't ready for summer, these jars definitely put is in the right frame of mind. I love the color. To serve iced tea or for canning will be their uses at my house. How Pretty! I love the creative ways you used the jars, friend! I'm inspired!! I'd probably use some as drinking glasses... Love the color! I have two cases of last year's blue, and I love that the green are available in quart size. I would use them to organize things and bring a pop of color to a room. Or as a vase forcwildflowers. I love the green Ball jars. There are so many ways to use them in my every day life. Thank you for the opportunity to win a case. Ooohh...I just LOVE these! I would definitely use them for many things, just as you have. I have some of the more aqua color but not sure if they are Ball brand or not. I also have a larger few antique ones in a pale aqua with the galvanized and ceramic lids. The uses for these jars are unending. Thank you allowing us a chance to win these!! I love what you have done with these beautiful jars. I would use them to hold flowers, and the green is a perfect backdrop for roses, and many other flowers. Thanks for the giveaway! I totally love these jars too!!! I could not get enough of the blue ones last year:) thank you so much for this chance! 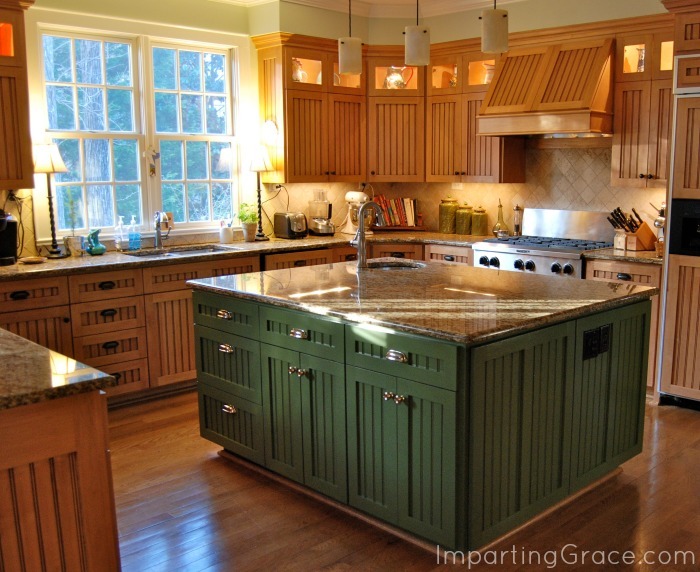 Love the color of these jars - and your island looks fabulous - what a great kitchen you have! my kitchen is green and yellow, so they would match perfectly!!! thanks for the chance to win! I love all Ball jars of any size, shape, or color!! Adorable!! Thank you!! Did you know that the Twitter name posted in Rafflecopter is not yours? I went on Twitter to search because that name only had 6 followers and I knew it couldn't be right. I would use them as vases for summer flowers! I generally do not like green but I love these jars. flower vases. They would be great on the deck. Love this pretty color! I'd probably use some for decorating and some for canning. Love the color...I'd love to add some of these for storage and color in the pie safe and one for some spring flowers. I have three original Ball jars and would to them with the green ones. I would use these jars in the craft room. Hope I win this one thanks so much for the chance. I thought the blue was over the top beautiful and spent all summer looking for them. Now I can see the green will be the topping on the cake. I've got the blue finally so please don't make me wait for the green! I'm doing island over in green too....can't wait to show it off. I'm still lovin' the blue jars but these would be such a perfect addition. 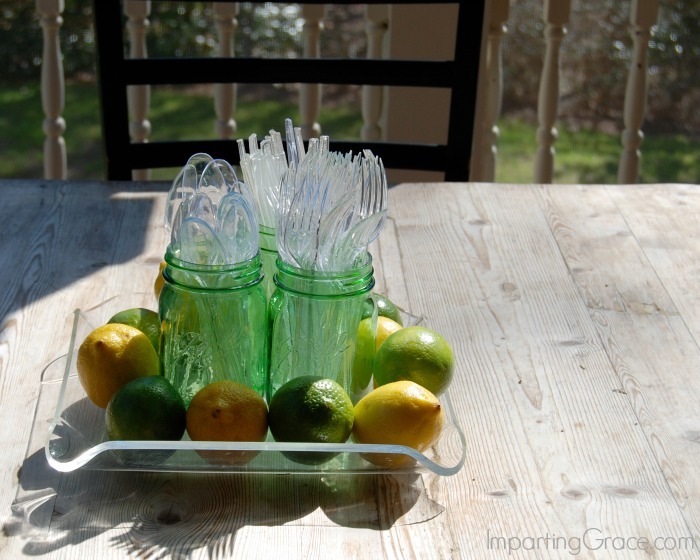 It would be so much fun to use them for homemade lemonade this summer! I purchased these right away when they came out. What a great giveaway and I would love more!!! How pretty! I love the new green color :) They do make beautiful summer glasses. I think the green mason jars are quite pretty! 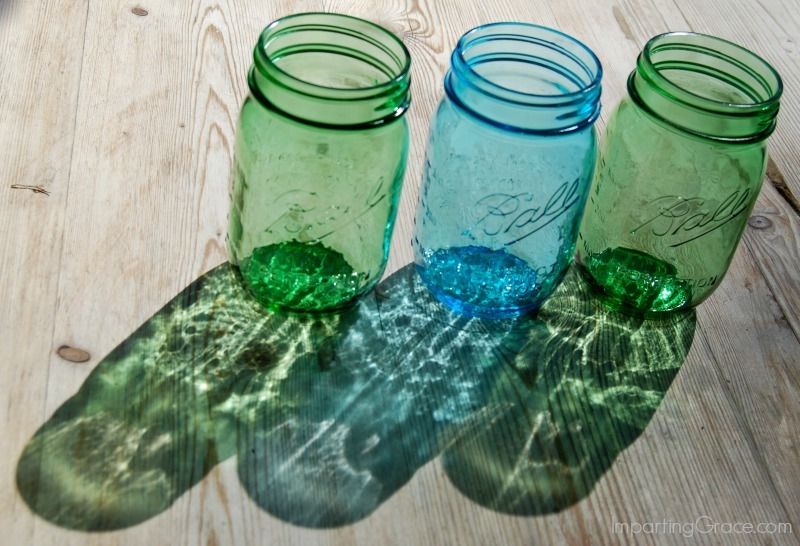 I have a great collection of vintage blue mason jars and they are handy for so many things! We'd probably drink out of them. I use Mason jars for everything! My pantry has sugar to dog treats stored in them. I use them for silverware holders for BBQs and I even have a kerosene lamp made from a Mason jar. These green ones are GORGEOUS! I would love to decorate my kitchen with these! My dad has lots of peach trees, so I'd fill them with canned peaches.